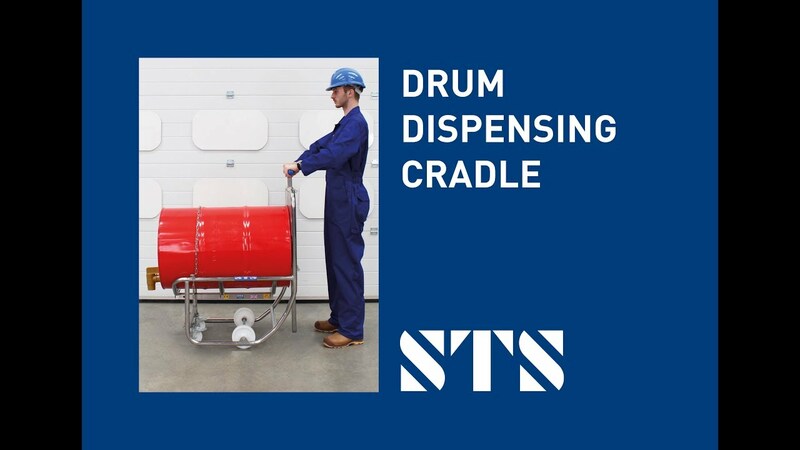 The STS Drum Dispensing Cradle enables you to move 200-litre drums from a vertical to a horizontal position with low levels of effort. We designed and purpose-built this unit for decanting steel and plastic drums, and the cradle has a decanting height of 350mm. 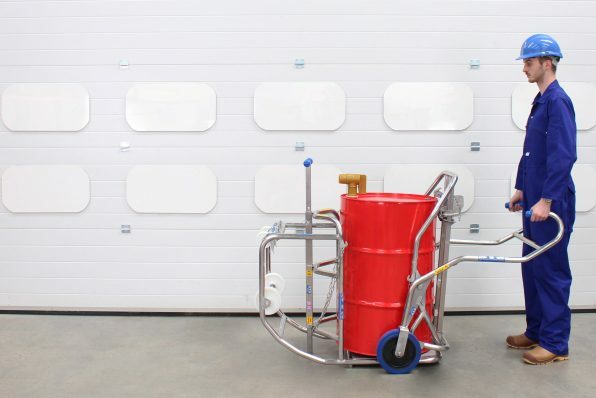 The movable handle and braked castors make this unit an ideal decanting station for 200-litre drums. 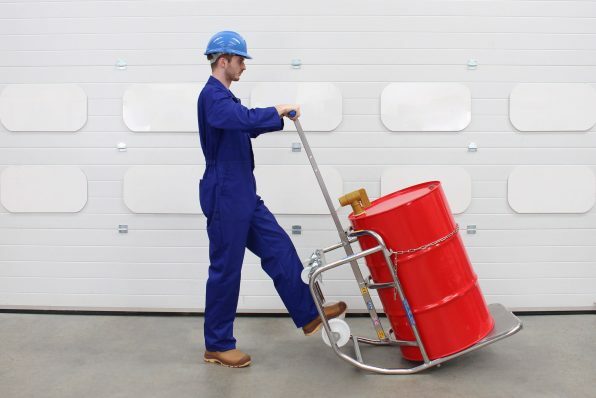 Using leverage and engineered geometry, our drum dispenser can significantly reduced the amount of effort you need to use to move and decant drums. 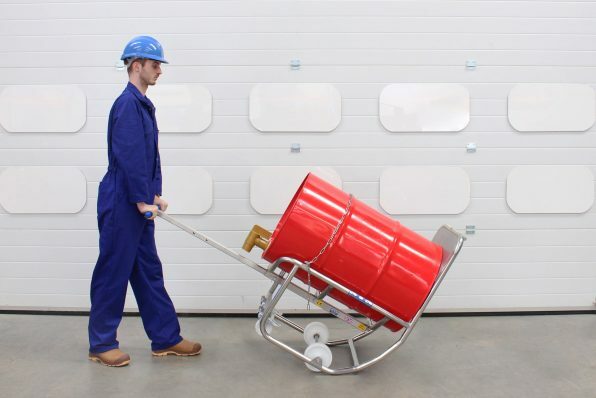 You can orient drums weighing up to 300kg ergonomically, with an input load below 25kg. 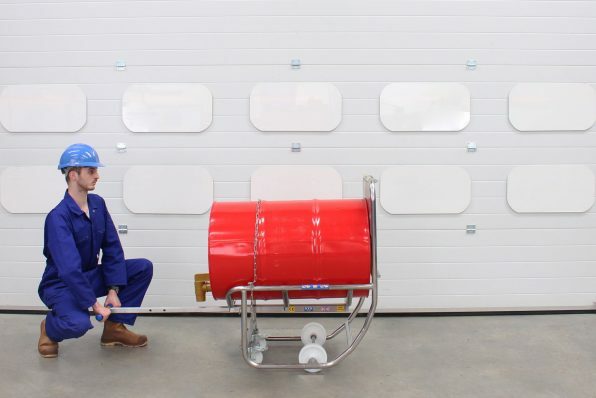 Load your drum onto the baseplate of the drum dispenser using our Universal Drum Trolley (pictured), an STS drum lifter, or another suitable and safe drum dispenser. Once you’ve loaded the cradle, use the stainless-steel chain to secure the drum in place. Our drum decanting units offer great solutions for emptying drums into smaller vessels. 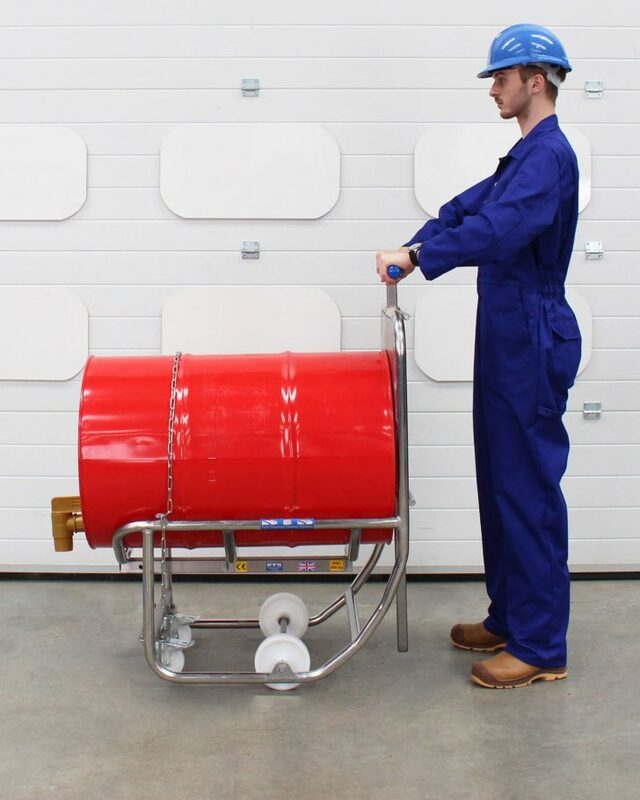 If you need to empty an entire drum into a process then it may be better to take a look at our universal drum rotators, which offer far greater decanting heights. Use the unit’s handle to turn the drum 90° from vertical to horizontal and vice versa. When the drum is in the decanting position, you can remove the handle and place it on the other end of the cradle using the locking pin. This allows you to move the unit around with the drum in the decanting position. 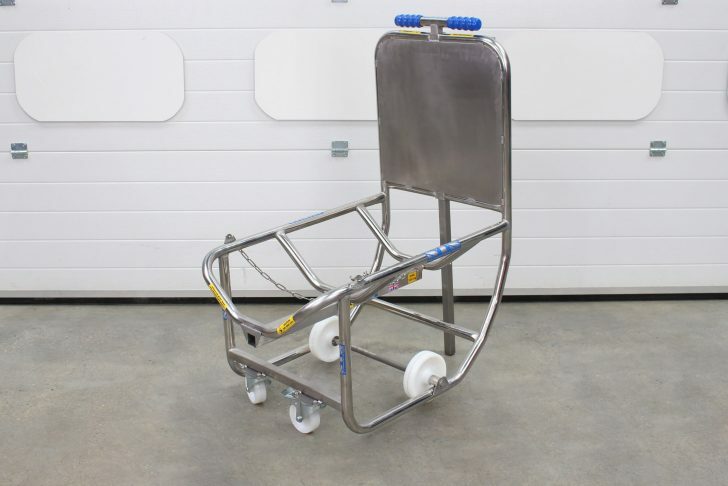 We manufacture this drum cradle in full stainless steel, making it particularly suitable for the food, chemical and pharmaceutical industries. Stainless steel is far superior to other materials when it comes to corrosion resistance; we design our drum handling equipment to last. Our customers often keep these drum dispenser cradles in a specific location where staff go to decant small amounts of material. 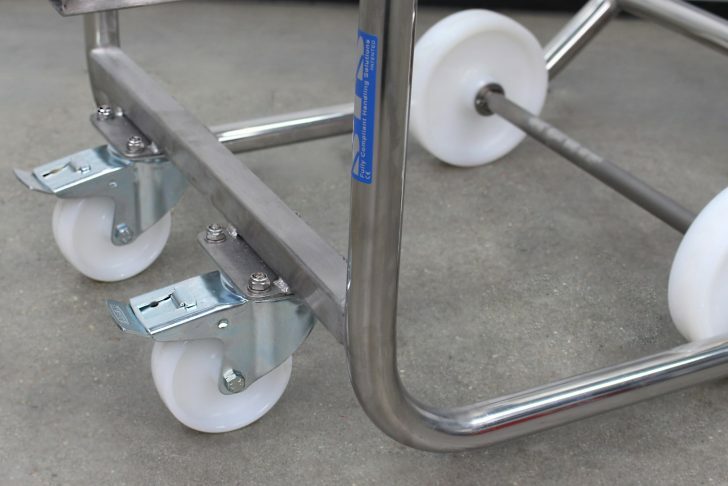 Our braked castors ensure that the drum and cradle stay static and stable when you’re using them. 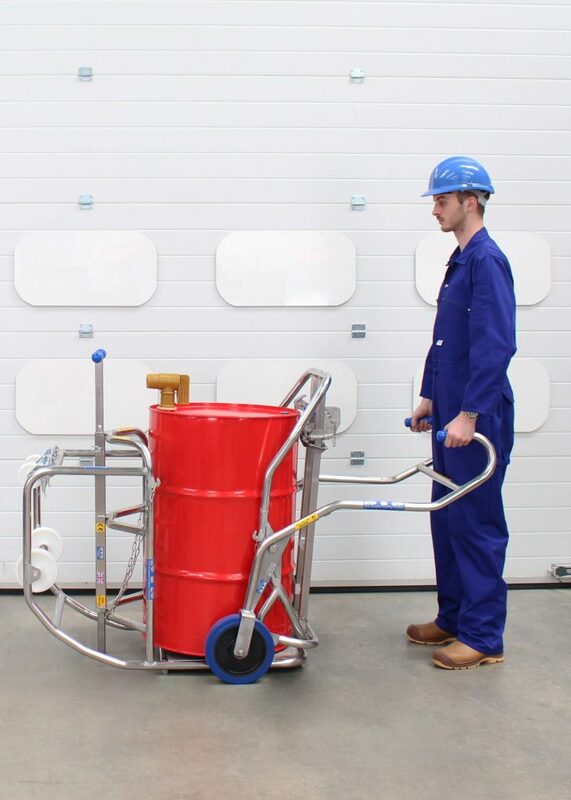 Our Drum Dispensing Cradle is suitable for handling 200-litre straight-sided drums. 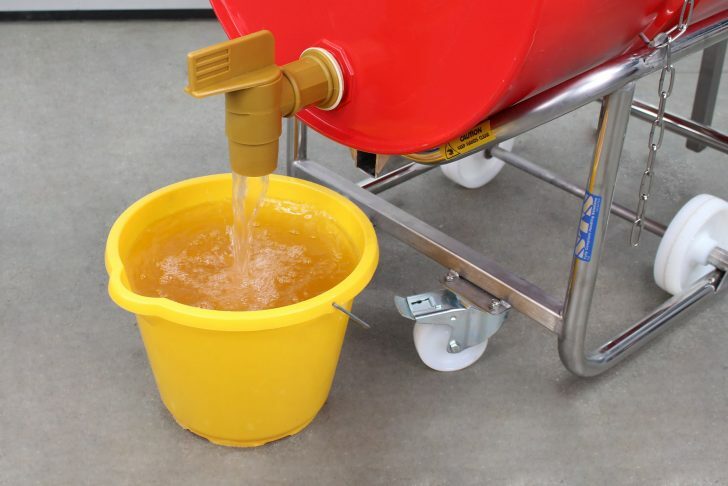 The geometry of the cradle means that you should only handle 200-litre drums with this product. 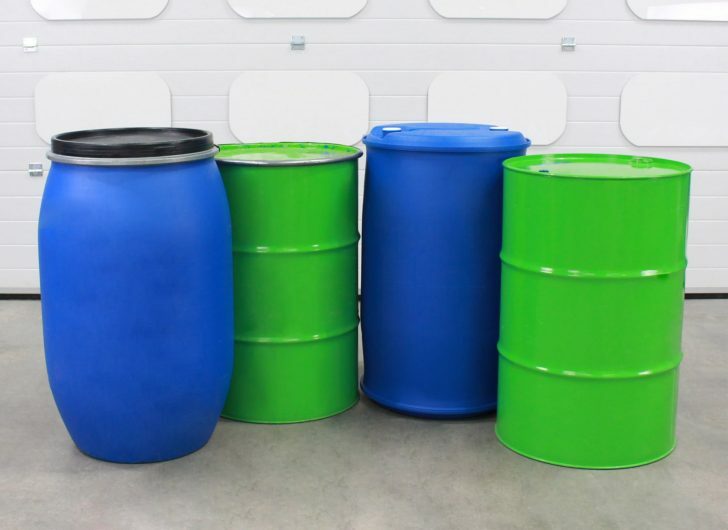 For more information on compatible drum types, see the drum suitability document by clicking the button below. 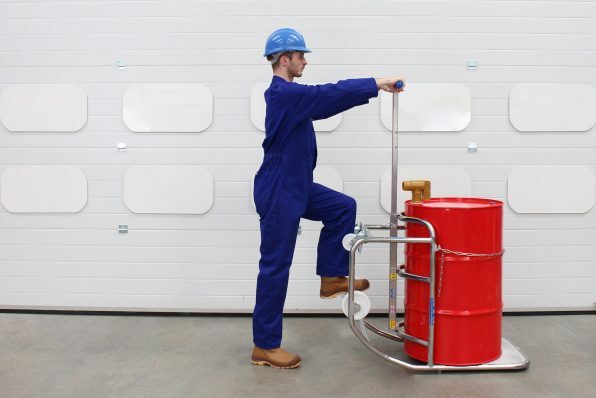 We can provide a fully-certified ATEX drum cradle for use in hazardous work spaces. Our DCR01-Ex is suitable for gas and dust classified spaces: Zone 1, 2, 21 and 22, where explosive or potentially explosive atmospheres exist. Our ATEX cradle is manufactured to ensure electrical continuity, a path to ground is always present. We supply our ATEX models with a manufacturer’s EU Declaration of Conformity stating compliance with the ATEX Directive 2014/34/EU. 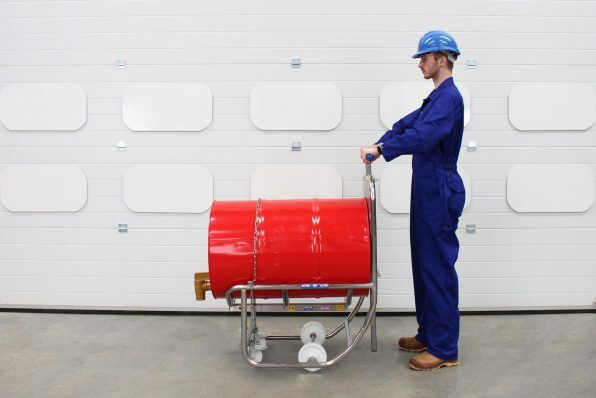 We can provide this drum cradle certified to ATEX Directive 2014/34/EU – suitable for use in potentially explosive ATEX Zone 1 environments. See the full technical specification for our 205L Drum Dispensing Cradle for details such as weight, dimensions and load capacity. 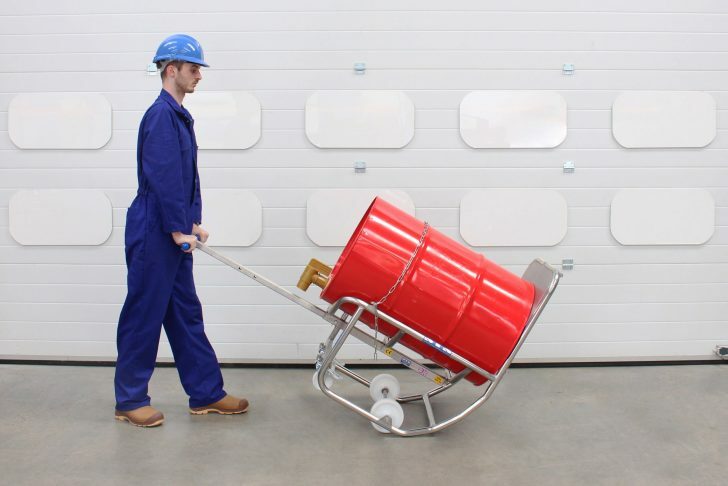 View the instruction manual for our 205L Drum Dispensing Cradle, which details how to safely operate and maintain the unit.